Posted by Briana Hammontree on November 29, 2018 in Lifestyles. The lights were low and the audience small as Ferris advertising junior Madison Keliin was the first of four Prism winners to read her own work. 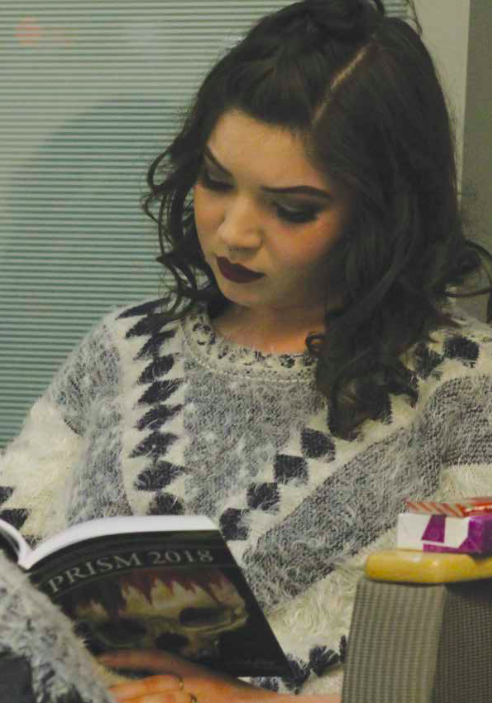 Prism is an annual student writing and art competition that is held by Ferris and sponsored by the Department of English, Literature and World Languages. Prism 2018 winners were able to read some of their work at FLITE Tuesday Nov. 13. A first-time contestant, Keliin began with her Prism poem that won first place, “Fifty Shades of Grey Matter,” which was about a previous relationship and the attraction to an individual’s mind. “Poetry, to me, is one of the most creative and challenging forms of writing there is. It makes me choose my words with more care, and lets me express my thoughts in a way that I can visualize,” Keliin said. As well as winning first place, Keliin also won honorable mention for her poem “Eggs.”, a feminism piece which was the first poem she ever wrote and based upon a personal experience. “The thing is, sometimes I think I get too personal with my writing sometimes. And I think sometimes I should pull back, but then I remind myself that this is where you’re sup- posed to be personable and where you’re supposed to ex- press yourself and push boundaries,” Keliin said. While Keliin fought off the fear of being too personal, Ferris English junior Stephanie Udell fought the fear of losing. “The experience was nerve-wracking. You have these voices in your head where it says that you aren’t good enough, you can’t do it, like you’re not going to win,” Udell said. After battling the self-doubt, Udell, another first-time contestant, was a short fiction winner after submitting her piece “An Apple a Day.” In this piece, Udell reflected on mental health and the stigma it holds within eating disorders, wanting to explore this topic because of its criticism in society as a taboo topic. Ferris history senior Mikayla Baarlaer’s preferred writing approach is writing shorter when it comes to flash fiction or poetry, saying she likes the quick impact the story provides. Baarlaer earned honorable mention for her work, “Paper Weight,” a short fiction tale about a girl who is in love with the constellation Orion and reflecting on this infatuation while sitting beside her boyfriend. “The hardest part about entering the Prism would have to be gathering up the courage to submit something. The writing can be hard, sure, but it can be even harder to put yourself out there. You just have to remember that the worst they can say is no, and no one will be any the wiser,” Baarlaer said. Writing categories for the Prism contest include: freshman/sophomore essay, freshman/sophomore research paper, junior/senior essay, junior/senior research paper, technical writing/professional writing/script writing, poetry and short fiction. Art categories for the contest include: pen and ink, oil, watercolor and acrylic. According to the contest rules/guidelines and the terms and conditions, students who are interested can submit their Prism work through https://prismcontest.submittable. com/submit, before the March 25, 2019 deadline.